With a new lease of life, Saru is a changed character after he survived what his race believed was a life-ending moment. One of the red masses of energy have been detected at a new location and this time it's taking the Kelpien home - it's appeared over Kaminar. So what's going on - is this all part of some massive plan we have yet to discover? How come the Red Angel seems to be helping Discovery or placing it in locations where it can do good. to dig it out on Netflix and get it watched because you will appreciate those 15 minutes to give a little meat on Saru's backstory bones. That said, The Sound of Thunder does stick in a few parts from the short just to make sure you're covered. Unusually for this season the A story dominates the episode with just a few moments left to remind us that Doctor Culber is back from the dead and in the best health of his life in a brand new body that doesn't even bear scars that he'd had for years. How else Culber has changed is left unsaid yet there's the distinct feeling that we have much more to uncover in the weeks coming. The bulk of episode six focuses on Saru. Accompanied by Burnham to Kaminar he is reacquainted with his sister, Siranna, who is now the village priest and leader of the community. The Ba'ul are quickly aware of the arrival of the only Kelpien ever to leave the planet and are more than a tad anxious to have him back permanently. 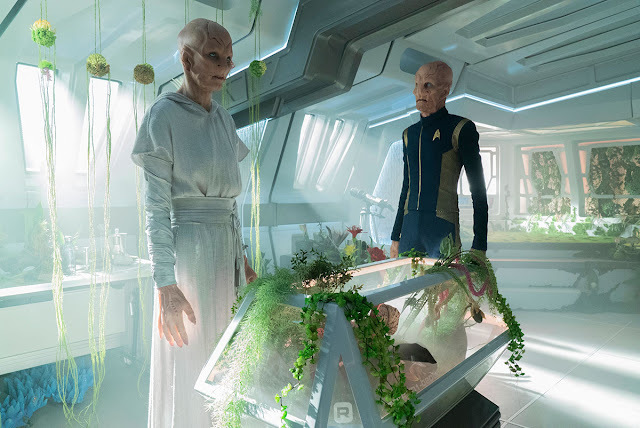 Everything boils down to the harmonious Great Balance that has been set in place by the predatory Ba'ul but, of course, because this is Star Trek there's a huge twist in here well worthy of the franchise. The Sound of Thunder is quintessential Star Trek placing the Prime Directive in conflict with the crew and Saru's desires for his people. Interference could destroy the even keel that the planet has experienced for generations and truly it's a dangerous point that could tip either way. Doug Jones' performance as Saru smashes the episode; no longer is he frozen by fear but confronts the Ba'ul on the bridge of the Discovery and takes the fight directly to them. The Ba'ul are also finally revealed here after numerous mentions through the season. Now, for long time fans there will be a "Isn't that...?" moment because the alien lifeform we encounter has a striking resemblance to Armus from the first season The Next Generation episode Skin of Evil. The Ba'ul representative is one of Star Trek's truly terrifying aliens virtually dripping evil in every scene. Word for the future - just make sure the voice isn't distorted too much because there were a few words I didn't manage to pick out in the rumble. 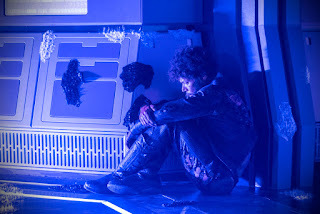 Hannah J Spear as Siranna is fantastic alongside Jones as the two confront their species' nemesis face to face and it can't be easy to play out the terror, anger, pain and more that she and Doug manage through the layers of Kelpien makeup. That said, the partnership between Sonequa Martin-Green and Doug Jones goes from strength to strength and is by a country mile the strongest relationship on the show. I would honestly just watch it for these two after the ups and downs of this year alone. Marvellous acting and one of the best Star Trek duos since Spock and McCoy. Of course, there's a link in to the Red Angel as you would hope since it's teased from the very start of The Sound of Thunder and to date this is our biggest reveal of the mysterious creature/form/thing that's providing the arc for season two. We actually get to see it and, yeah, it doesn't really tell us anything but the speculation will at the least have another layer added to it. Certainly this episode places the Kelpiens in a very different place to how we began the show in 2017, fundamentally changing their identity and purpose to exist ultimately showing the prey species to be far more powerful than suspected by the viewer and themselves. The Sound of Thunder is truly in the same vain as classic Star Trek with the crew arriving to assist in the development of a race but restricted through the confines of the Prime Directive. Saru might twist that a bit here but I have strong echoes to stories such as The Apple, Miri, Return of the Archons in the style of the narrative and the strength of the performances throughout. But - are the Ba'ul in the wrong? Were they just protecting their own survival and just where does the Prime Directive lie in all this? The Sound of Thunder asks questions and makes the audience think beyond the credits and in a way that the first year never did. Discovery seems to have cracked the Trek code. Starting to get a little bored of saying this but once again Discovery has delivered. Providing further teases around the Red Angel arc and building in a greater understanding of the Kelpiens as part of the Galaxy Building begun back in season one. Magic from beginning to end and definitely one of my top three from the show. What might the Red Angel be? Is it someone we already know or a new character? What is it with fourth seasons? 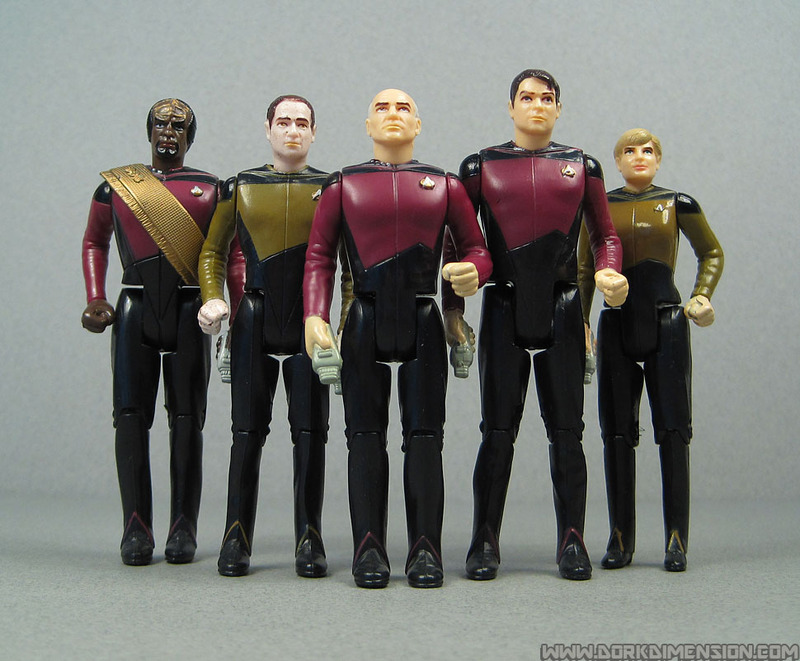 Deep Space Nine brought in Worf and then two years later Seven of Nine steps onto Voyager. It's a landmark moment for the show as Kes departs and Jeri Ryan eased (perhaps not the best word) into the catsuit. Scorpion, Part II which kicks off the year is devoid of silvery bodywear however as we see Janeway forge a Borg alliance to defeat the CG-evil of Species 8472. A bold move to make the Borg an ally for the episode and rightfully they do go back on their word/try and do things better almost from the word go. 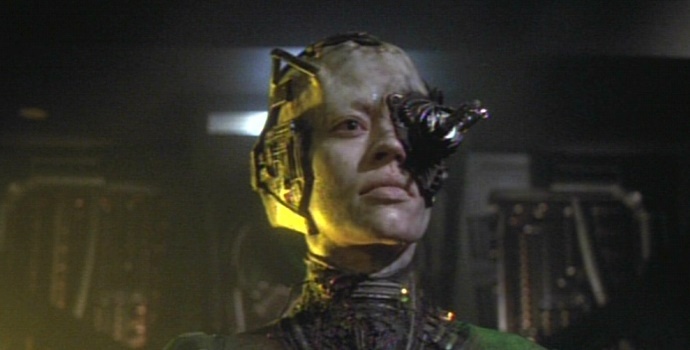 Seven of Nine provides a voice for the Collective in much the same way as Locutus although there is never a desire to leave the Borg at any point unlike Picard's enforced alter-ego. I like Scorpion and both parts are solid instalments and I do wonder how it would have worked if not for the Seven-as-contact device used here. Understandably the year is dominated by her arrival and she is used at every possible occasion although the only real Seven episodes are this opener, The Raven which eludes to some of the former drone's backstory as well as introducing us to her parents' crashed research vessel. A necessary tale to give us some breadcrumbs around Seven's origins which would be revisited a year later. The other major Seven episodes of the year actually close out the year. Firstly there's the One letting Ryan flex her wings solo for a good portion of the episode as she oversees the ship through a region of space deadly to the crew if awake. Then there's Hope and Fear, which acts as a bookend to the season and notes how far Seven has come. The Janeway/Seven relationship is clearly evolving at this point. The biggest events of the year were keystoned with two stunning two-part stories. Year of Hell - originally envisaged as the finale of season three, its Voyager going concept once again but on another level. The vision to play out a whole year of action is like nothing else before it. Voyager is battered within an inch of oblivion, not everyone survives and again we're teased with a what-could-have-been before the big reset button gets pressed. The other huge season moment came in the form of the Hirogen mini-arc that trailed through Message in a Bottle, Hunters, Prey and finally The Killing Game. 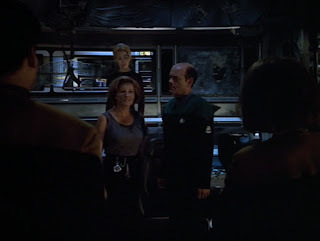 The first part introduced their communications network and brought Voyager into contact with the Alpha Quadrant for the first time proper and I feel marks a cornerstone of the show opening up a whole new direction that would be further realised though the Pathfinder thread in seasons six and seven. 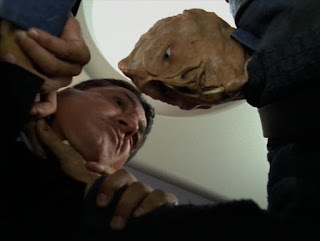 Hunters and Prey revealed the true nature of the Hirogen who remain my favourite original Voyager villains and are very much episodes there to set up the excellent two part arc finale. For the second time in Star Trek history the Second World War takes centre stage as one of the multiple scenarios the Hirogen are running across Voyager's expanded holodecks to continue the hunt. In a similar way to the later Workforce, the crew are unaware of whom they truly are, forced to endure life-threatening injuries over and over as the Hirogen hone their skills. It's one of Voyager's more violent moments but executed ever so well, possibly because I find the Hirogen so watchable. Their only other appearance however would be in season seven's Flesh and Blood. 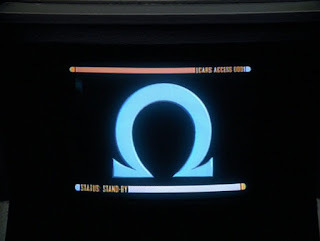 Talking of reappearances, the episode Demon would also introduce a duplicate biomimetic crew who would return a year later in Course: Oblivion. While this first story brought these creatures into the show, it would be that later sequel that would really be the stronger of their two appearances. Along with the Hirogen arc and Hope and Fear, the real highlight of season four has to be Living Witness. Sending us into the future beyond Voyager's time, the Doctor is reactivated on a world which sees the Starfleet vessel as a terrifying battleship crewed by dark misinterpretations of Janeway and the others. Part investigation, part exploration of the way in which history can be rewritten to suit a cause, Living Witness may be a Doctor story but the ideas and changes that are made within the narrative are very, very clever indeed. I would rate it as one of Voyager's best ever episodes and demonstrated that the show was much better when it pushed the envelope and went into conceptual territory that neither Deep Space Nine. Aside from these the rest of season four is surprisingly mediocre. Each of the main cast gets their moment in the limelight but there are very few major standout episodes. One, in which Seven is the only crew member left awake to run the ship when Voyager chances across a toxic area of space, certainly leaves Jeri Ryan to shine in a season which has definitely focused on the new arrival. One leaves the actress very much solus and takes her exit from a collective consciousness to another extreme of solitude. Seven also turns out to be the saviour of the moment with the Doctor in Scientific Method. An episode that borders on slight horror, the crew are being subjected to experiments that they are unable to see. When Seven does get to take a glimpse out of phase we see all sorts of contraptions being stuck to the crew to aid the Srivani's "work". Concerning Flight earlier in the year is a Janeway moment for example but more than likely remembered for the second - and final - appearance of John Rhys-Davies as Renaissance man Leonardo da Vinci. Taking a character off the holodeck is fun but by this point its getting old hat. Bit too much formula recycling on this one even if it does rely on the holoemitter rather than a transporter accident. Kate Mulgrew's other biggie of the year (besides the finale) is The Omega Directive which turns thirty years of lore on its head just with the title. The concept of something that could overrule the Prime Directive is inspired with Janeway going super-secretive under the ruling of one of Starfleet's most serious commands. Adding a Borg perspective into the episode made it even better especially since we got to see what they aspire to become. 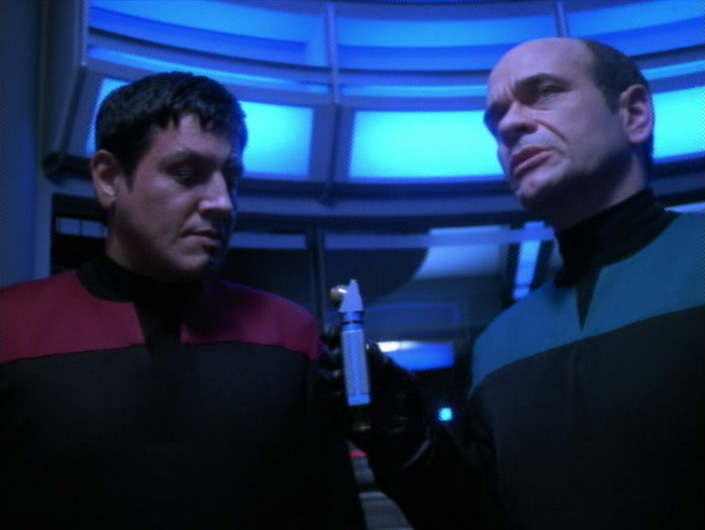 Chakotay even manages a decent outing in Nemesis. An early entry to the year, it deals with mind control and conditioning pretty successfully. The first officer is totally immersed in the belief that he is fighting a dangerous enemy when in fact he's been influenced through an impressive "media" campaign/training programme. Only let down? Some of the "alien" communication forms are a bit cliched. Still one of those episodes which improves over time as I was never that taken with it in the 90's. He's also centre-stage for the nightmare episode Waking Moments. Taking a lead from both Night Terrors and Schisms it seems we have baddies lurking in a sleeping state who plan to take over the ship through the crew's sleepy time. I actually really enjoy this one because it is just so perverse and a little crackers. Tragically any call for Chakotay to seek out some mystical stuff is a bit cringe-inducing and somewhat wrong that Native Americans are being stereotyped into this hole by the show. And the others? Well, B'Elanna gets to drift around in space for her Day of Honor in a low rate Klingon-related story that has her flitting about her mixed heritage. Shame with these is that anything Klingon was being nailed a lot more successfully on Deep Space Nine with Worf and/or Martok. B'Elanna also gets top billing in Random Thoughts again at the early end of season four. With the arrival of Seven you do get the feeling that the producers were keen to remind us this wasn't a three horse show before it solidly became just that. Random Thoughts plays on that Klingon background again with the added bonus of a black market trade in violent thoughts. Where does Voyager come up with these curve balls? The season does offer a lot of variation if not all of top quality. In this case the story does become a little over talky but does deliver something provoking that pushes me to rewatch it. Paris perhaps fairs the worst of the main cast, getting just one strong individual outing in Vis a Vis. It's a good opportunity for Robert Duncan McNeill to shine and play a different character and add an ounce of comedy into his performance. Not a top liner for the season in this story but certainly enjoyable and easier to recollect than some others I can think of. As for Neelix well, he dies. Maybe this was some kind of sick joke by the producers but he does actually kick the space bucket only to be revived by Seven's nanoprobes within the televisual hour of Mortal Coil. Therein follows a ton of soul searching and moral dilemmas which, probably, no-one watching was really fussed about. Probably the drabbest moment of the year and certainly instantly forgettable as an episode. Would I drop this into my worst of the show list? Yep. Unquestionably. The concluding episode of the year - and oddly not a cliffhanger either - is the superb Hope and Fear. As noted it does play on that Janeway/Seven combination that became a staple of the show and certainly had its moments in this year most notably with this episode. Hope and Fear has a simple enough plot which links in the communication with the Alpha Quadrant, a possible way home, the Borg, key relationships and a cool new ship design all in just 45 minutes. Potentially one of the most packed Voyager episodes ever and yet it works out perfectly. A strong year for Voyager and one that would indeed be built on with the equally notable fifth season. Back in the day I did enjoy a good episode from the show but this return 15 years later has highlighted how great and original it could be. As with Deep Space Nine, Voyager was doing things that neither The Original Series nor The Next Generation could with their more singular episodic outlook. 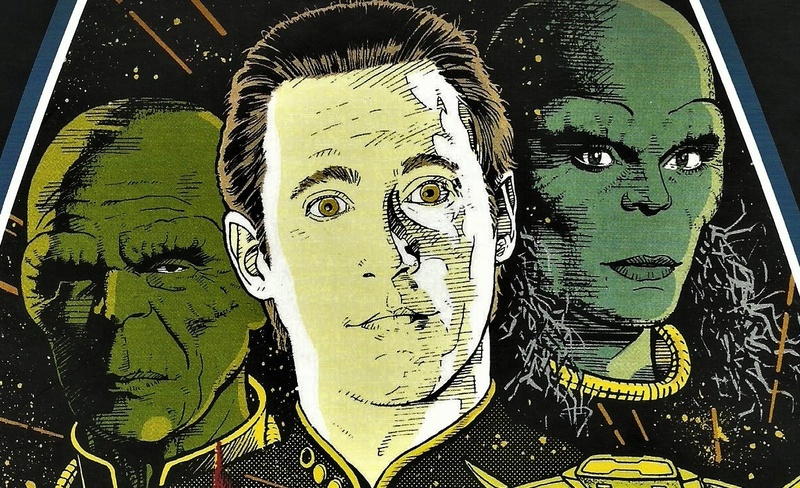 Was season four Voyager's finest hour? Did it build on the legacy? 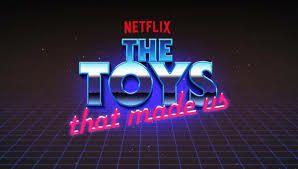 Already one of my favourite Netflix series, The Toys That Made Us opened up its four episode second season with a corker. 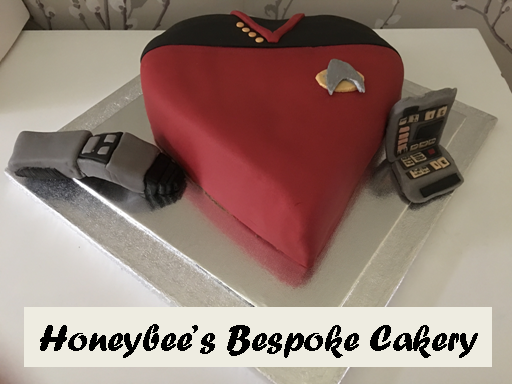 Not particularly known for its toy lines, Star Trek has a rich history of merchandise and with the online streaming service now showing every televised minute of the franchise its fitting that Star Trek gets to sit alongside luminaries such as Transformers, GI Joe, Lego, Hello Kitty and...erm...Star Wars. 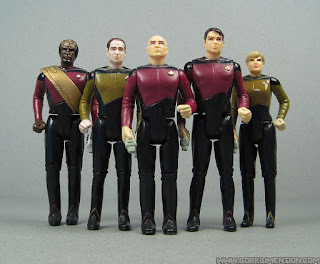 The toy lines have an incredibly bizarre history as the show explores from the 1960's era of AMT model kits, re-stickering existing unrelated items with the words Star and Trek through to the 70's period of flashing light helmets and the important Mego figures then on into the 80's Galoob figures (and all their errors! ), the phenomenal success of the Playmates range in the 1990's and cruising to the Diamond Select, Eaglemoss and MacFarlane licences of the 21st Century. The Toys That Made Us displays a somewhat colourful picture of the past to Star Trek merchandise. It seems that the companies responsible for producing the goods couldn’t time releasing their ranges with the franchise’s highs for many years and the quality was varied especially in the early days. Add in a flying Enterprise, tanks and even freezicles and you can see a franchise being plundered in any way possible no matter the accuracy and quality. For an overview, talking heads come from the former head of Mego, the Tenuto family, the Trimbles, Doug Drexler - but noticeable through absence are any faces from Eaglemoss (Ben Robinson) when the show heads into the realms of The Official Starships Collection and the future of the franchise in toy form - although I might disagree with calling that collection a toy?! In addition, there's not even a mention of the Micro Machines starships from the 90's which reflects the fact this is much more tied to the history of Star Trek action figures rather than ships and playsets which get the occasional aside. There are more than a few memories in there for myself as a collector since the 1980's but it's what's not mentioned that really isn't explored as much as it could have been. 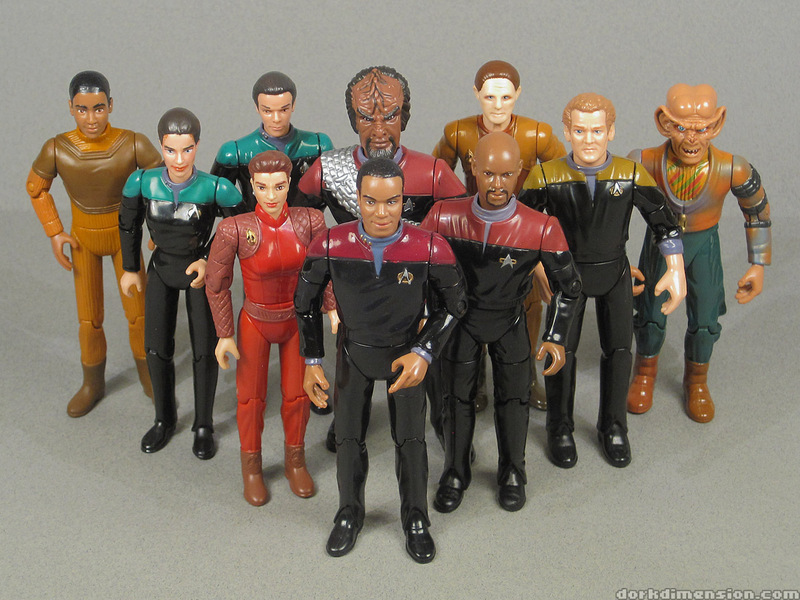 There are not only some stupidly off the wall ideas that actually made the production grade but what of the cancelled Galoob second wave of toys or more recently the axed Diamond Select Deep Space Nine waves? Hearing about what happened to cause these "failures" would have been a great addition although I might suspect it's down to the matter of timing that the licence holders have been getting wrong for decades. There is mention of the "1701" collections that meant collectors were scrambling for a limited number of items to complete their sets and which inadvertently was a factor that made sales crumble. 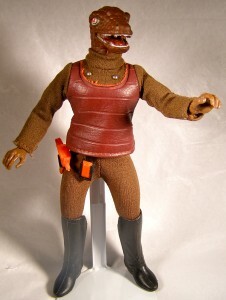 It's amazing as well, considering how precise fans can be around screen accurate replicas how much has been produced "cowboy" style or with some major tweaks to make it highly cost effective with one of those being the mix-and-match creature parts pressed into service for the brown-skinned Mego Gorn figure. This is perhaps one of the more prominent The Toys That Made Us because it focuses on a franchise that is blindingly present but yet really failed to make a significant dent on the market when it comes to kids toys. Look at the other names in the series and all of them have reached silly heights of popularity whereas Star Trek has trundled along in the background, some might say, for many years just keeping itself above water and paddling for dear life. 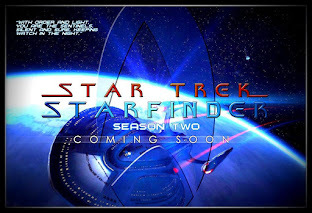 Each of the lines has fallen foul of some error along the way which has caused them grief but the show looks positively to the future with the continuation of the JJ reboot and the launch of Discovery providing not only a new range of potential toy lines but (and unsaid), a whole new generation of buyers too. Interestingly this is one series of toy lines that seems to admit it's appealing to an older generation of collectors rather than children playing with them which has led to the need for superior accuracy on all levels and an adherence to canon rather than continuing to stick new labels on other toy lines. Maybe there could have, ironically, been a little more detail in each of the sections covered but there is only a 45 minute run time for each episode of the series which might prove to be the restriction. 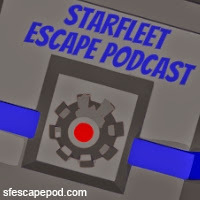 How I managed to miss publishing this so long ago is a total mystery but hey, this is a great episode that fills in some gaps and shows that Trek's merch history is certainly eventful. Definitely worth checking this one out on Netflix as soon as you can! Tilly is gone and the Discovery is back in pursuit of Spock's shuttle. However just when you think the chase is over, who should step out of the cornered craft but one Phillipa Georgiou. Seems that Section 31 have also been on the hunt for the evasive Vulcan having found the shuttle adrift. Georgiou is less than forthcoming with information leading Pike to face off with her 31 collaborator and former associate of Pike, Leland. After the Section 31 ship assists Discovery to complete its work later in the episode, Ash Tyler is assigned as the liaison between the two vessels ensuring we're going to get lots of conflict for the rest of the year. But this is a minor issue when faced with the realisation that Tilly has vanished. Not dead as it turns out but instead secreted away into the mycelial network by the beings within it who have been damaged with contact from the Discovery every time it jumps. 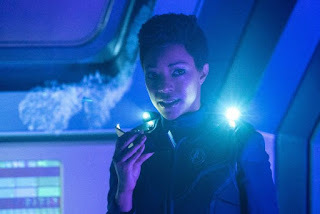 Stamets comes up with the creative idea of using the Crossfield Class starship to wedge open the door into the network to be able to retrieve Tilly who is seemingly on the other side with a recreation of her primary school classmate May. Stamets and Burnham cross the threshold and enact a rescue but it turns out that a monster that has been terrorizing the network is - and that would be telling. Goddamn Discovery you went and did it again. 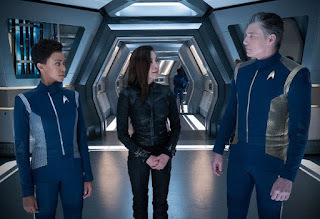 I already lauded a ton of praise on episode four, An Obol to Charon with its tour de force performances from Doug Jones (taking a bit of a back seat this week bless him) and Sonequa Martin-Green yet this week's hour of TV seems to have blitzed it again. 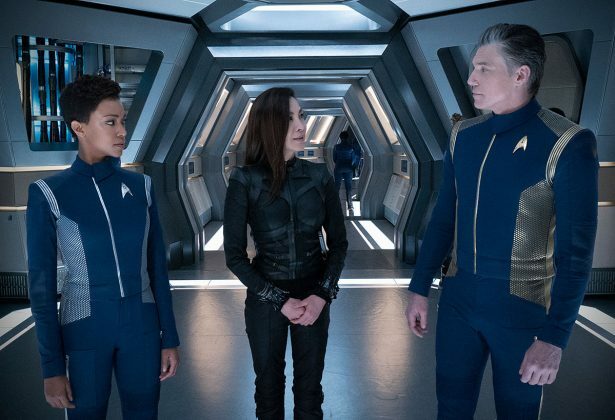 So much more is happening this season and each episode is rammed with story, off the cuff references to the rest of the franchise, superb acting and some of the best twists and turns Star Trek has ever pulled off. Even just taking into account the conversations between Pike and his opposite number on the Section 31 ship you can pick up the undertones of distrust between them even when the talk is all about working together for a common goal in securing Lieutenant Spock. While it's all seen from the perspective of Burnham, the real stars this week have to be Anthony Rapp, Mary Wiseman and - shock - Wilson Cruz. Yes, Doctor Culber is back via one hell of a warped mycelial explanation and a whole lot of emotional turbulence. 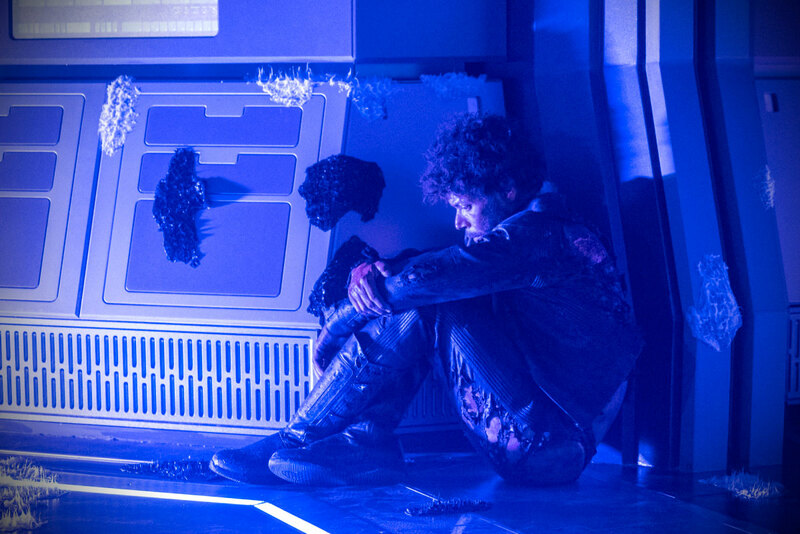 Rapp is brilliant as Stamets this week, driving forward the way to cross the boundary "safely" which leaves the Discovery acting as a doorstop and gradually being eaten away by the creatures in the network. Of course we knew that Culber was coming back for season two but after his brief appearance in episode one I thought we were in line for flashbacks and the like however the writers have pulled a true Kobayashi Maru with this being his full return rather than the tease. Cruz plays out a tormented Culber exceedingly well with all of his experiences under attack from the native lifeforms although they might be seeing it from a very different perspective. It might be a way to up the tension and impress the time limit of the rescue operation but visually it's amazing when coupled with the "fizzy bubbles" effect that permeates the ship in the sections that are trapped in the network. The look of the jammed Discovery too is magnificent with it seemingly beached in the network with that in turn gradually encroaching further onto the starship. 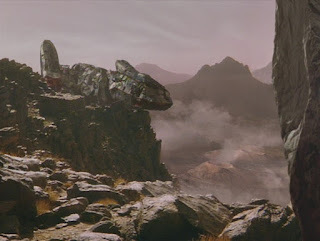 The reveal that Section 31 have been watching all this time is certainly unnerving and it seems that in the era of Discovery they aren't as secretive as they would become nor as they were during Enterprise since Admiral Cornwell knows all about them and they aren't exactly being very inconspicuous with that decloaking ship. Perhaps Discovery has some more defining of the organisation to work out. It seems here they are more an intelligence gathering operation rather than shadowy dealings that Starfleet doesn't need to know are happening. As for their technology, it's about a century ahead of "regular" Starfleet here with the inclusion of the badge communicator nod. All seems too flash for the Section 31 that we will "later" see in Deep Space Nine. Is there a plan here or have the writers just chosen to take a more overt look at the covert group? 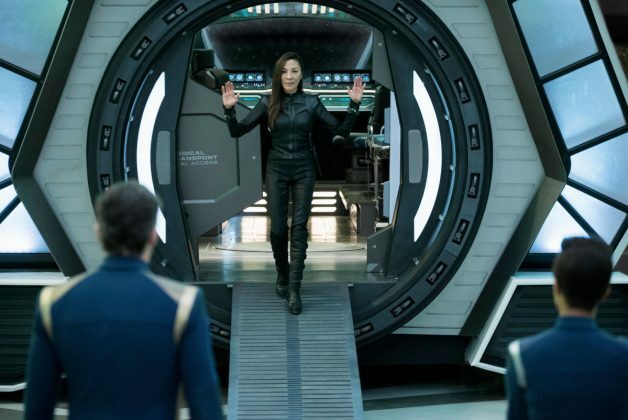 It does feel that Discovery has chosen this point to resolve the Tilly/May/network story and I do feel that it's run its course this season. Potentially this spells the end for the use of the spore drive since it's endangering another race and attempts to align the series with the rest of the franchise at least in some small way. Good choice as well to have Tilly toned down this week from the manic character she was becoming due in part to the spores which had sent her mind tripping. Wiseman has her controlling the situation here in something/somewhere she is completely out of her comfort zone of the Discovery's science labs. To be honest, I'm not that fussed if there are a few loose ends if the series is going to be producing stories of this calibre. The characterisation is a lot stronger with less reliance on Martin-Green to pull you through an episode. The whole cast is capable of carrying their own material now and season two is becoming more an ensemble piece where everyone gets to share in the meat of the stories. Saints of Imperfection has pushed Discovery further forward with more backdoor pilot material for the Georgiou spinoff. This may well be just an emotional sledgehammer of an episode as with Saru's near demise last week and I don't know if I could cope with the series delivering a third such instance next week as well. 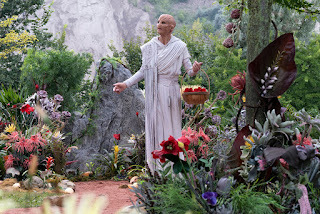 Discovery isn't holding back at the moment and by the end of Saints of Imperfection it feels that pieces are set in place ready for Spock's first appearance. Great episode? Season high so far? What do you think? Included in the 2006 Ships of the Line calendar (rummages in loft to dig out...), USS Bonaventure is one of those "What If?" missing links that make this collection so addictive. 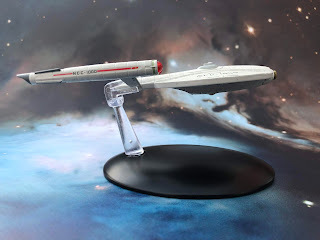 Conceived as the halfway point between the NX-01 and the NCC-1701 Enterprises (before the creator knew about the NX-01 refit), the Bonaventure has a foot in two series with the styling of The Original Series over a design that's clearly Enterprise. 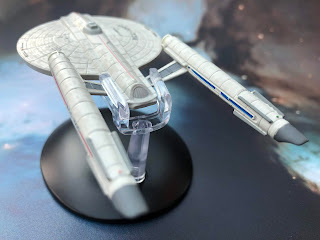 The model is an absolute blinder and while it's not one from canon, Eaglemoss have produced something a bit special here. The hull - at every point carries an asymmetrical aztec paint scheme that gives the replica real depth and quality. The top side of the saucer back to the shuttlebay and then up the warp pylons is metal with only the underside of the ship and the nacelles being made from plastic in this case. Hull detailing is excellent with precise panel lines and four grilles on the saucer being meticulously painted in. There's even the red and green running lights top and bottom of the saucer and on the ends of the warp engines marked in correctly. Scale does mean that the Starfleet pennant which stretches from the deflector dish to just in front of the bridge is squashed and you need to squint to make out the gold delta but it's definitely there. 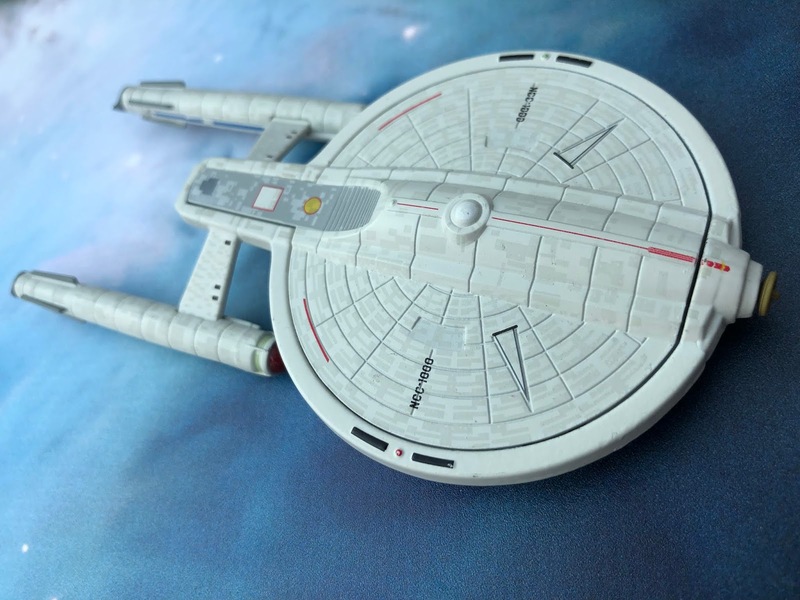 Also the two recessed window ports to the left and right sides of the bridge are very narrow but Eaglemoss have still managed to show that they do dip inwards away from the curvature of the hull. 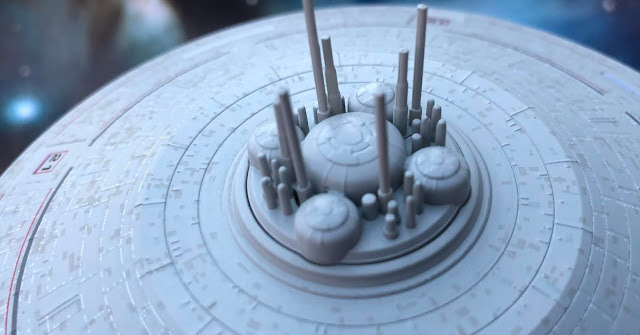 Unusually - and something that the USS Shenzhou would later bear in Discovery - we have double registry and ship names printed on the port and starboard sides exactly parallel. 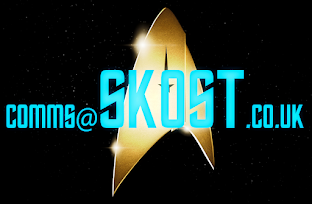 The double stripe continuation of the Starfleet pennant continues back from the dark grey bridge module. This in itself is much darker than any of the reference images show and it stands out like a sore thumb against the rest of the lighter grey finish. It also has a white dome to suggest internal illumination but for some reason the sensor dome on the underside doesn't seem to have this finishing touch - something evident in the magazine. Perhaps having learnt from their experiences on the original USS Enterprise from issue 50 and the multiple variations of it since, the deflector dish on the Bonaventure is gold. It's a statement of fact but this is a first in that it looks right in both form and colour. On the underneath the plastic bottom fits as an insert into the metal upper with the running lights and grilles included on that solid rim. 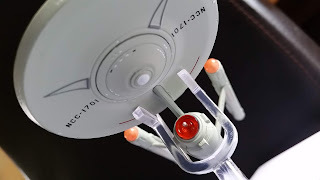 The underside detail of the Bonaventure saucer shows up the ship registry to port and starboard again as well as two more recessed window points plus those triangular sections which are a staple of the original USS Enterprise. These are decalled on in the case of the NCC-1000 and actually line up pretty well with the areas of the hull they are supposed to. Shock horror. 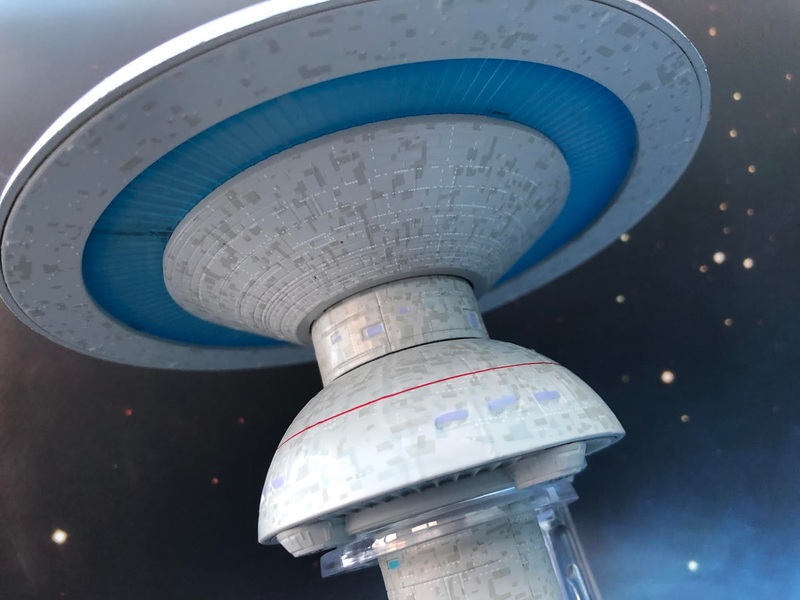 Now what is cool with the Bonaventure is that you have the raised section running down the centre of the saucer which, if you lifted it out, would resemble the engineering hull of thr Enterprise (near enough). To the back of the ship and highlighted in a darker grey paint scheme is that distinct scoop up to the shuttlebay which includes a square and circle marking that is lifted straight from the underside of the Constitution Class. That's the beauty of the NCC-1000 in that it it has so many hallmarks in shape, size and colour to those two other distinct classes of ship from two eras that you can spot in an second. At the rear there's the slightly more grey shuttlebay and just on the lip we can make out the dips for the impulse engines. Real shame these aren't coloured with the accompanying magazine confirming their little red existence. The pylons stretching out from the hull and carrying the warp engines have a basic block of dark grey along their middles to indicate the grille effect with the distinction between each segment sadly lost in the process. If you can manage to paint grey segments onto the vents on the warp engines surely it would have been done here instead of one grey swipe. A now familiar feature of the Eaglemoss ships, the bussard collectors on the ends of the engines are translucent and in the right light it brings a bit of life to the cigar-shaped propulsion units. They too are coated in the aztec paint scheme and finished with darker grey detail at their ends and in the grilles. The engines are really well put together with join lines barely visible and they are dead parallel on my model which always allows a sigh of relief. Bigger niggle ahead though because the stand fitting is dreadful and potentially model damaging. The clip is stupidly tight against the nacelles so you might want to file them out first before sliding the ship into place because it will mark the paint. In fact, aside from the minor whinge over the impulse engines this is a cracking creation of the ship as envisaged by visual effects artist Meni for the Ships of the Line calendar series. The intro to the magazine covers not just the creation of the generation-linking Bonaventure but also Meni's work on both Voyager and Deep Space Nine during the 1990's having the USS Voyager taking off at the end of Basics, Part I and also providing the space station model for the final pull-away shot in What You Leave Behind. This section also includes preliminary sketches for the Bonaventure as well as a guest appearance by its animated namesake. A quick double-pager covers the Ships of the Line calendar series and how it's evolved over 20 years from shelved projects to themed editions and beyond, right up to 2019. Closing out the mag we have eight pages dedicated to the work of Doug Drexler across the franchise from makeup in The Next Generation to editing the calendar each year and to breathing life into the Enterprise-J and helping to restore the original 11 foot filming model of the USS Enterprise for the Smithsonian Institution. 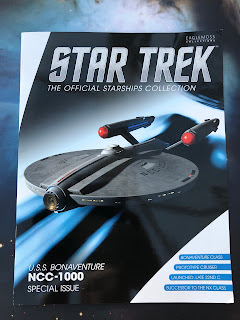 So we have to admit that this isn't official but some of the best bits of this collection have come from the curveballs - the Phase II and Probert Enterprises, concept Voyager...all well worth adding to your collection. Here with the USS Bonaventure is something a little more different from a visual publication that's been part of the franchise for two decades. It's a beaut and definitely worth sticking on your shelf. Adding the USS Bonaventure to your fleet? Let us know below! If you've enjoyed our review why not like and share? The fortieth edition of the series takes place after Into Darkness and we get a few call backs to previous Trek canon such as Section 31 and Khitomer. We also get to see Sulu's younger sister who plays a big part in this story. Section 31 and the Romulans are trying to destroy the Klingons and you can imagine Kirk doesn’t take to kindly to this and figures out a way stop them. Overall this is a solid story with a few nice nods to canon but it’s the next story in this volume that stands out and we encounter that familiar Star Trek trope The Mirror Universe-although this one is a bit different as we get to meet Captain Jane Tiberia Kirk and her gender swapped crew. It is a fun read especially meeting characters such as Jason Rand & this universes Scotty-Majorie Scott. You also what know the characters are going to do & say but it doesn’t matter as Mike Johnson has again crafted a great story that leaves us looking for more. We also have our usual off the wall Gold Key story which always manages a raise a smile! This issue's Gold Key release is A Bomb in Time which transports Kirk to 1955 and Scotty (looking oddly like a Vulcan) to 1855 in search of a scientist's deadly weapon. A rare Gold Key time travel instalment sees Kirk tracking the doctor on a movie set with his chief engineer gunfighting even further in the past. Total entertaining hogwash! 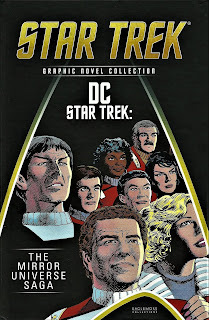 The DC Star Trek: The Mirror Universe saga is one of the greats of all time and a tale that this collection would have been idiotic to miss. It provides us with another alternative timeline, this time in a "What If..." The Voyage Home hadn't been made as this story has the Mirror Universe ISS Enterprise and her crew from Mirror, Mirror leading a potential invasion of our universe. 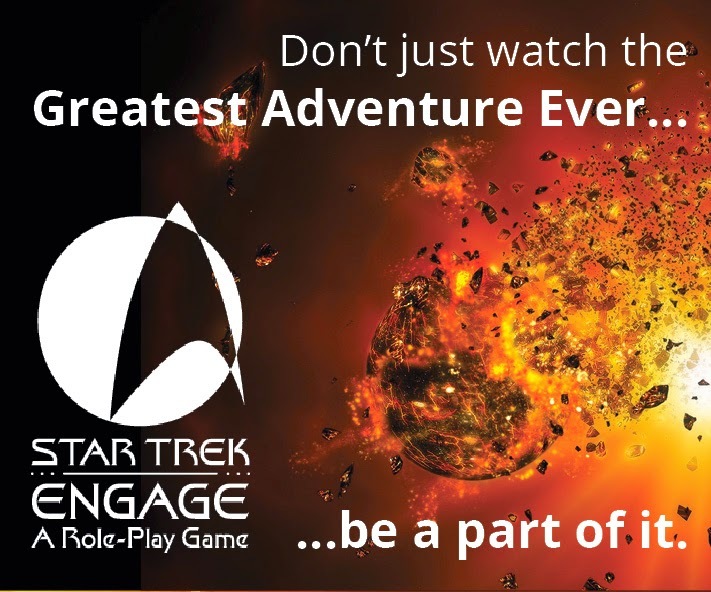 Bringing back the whole of the crew from the Mirror Universe, we also reconnect with Captain Styles and the USS Excelsior and travel to Earth and Vulcan in an adventure of galactic proportions. Spread over four issues the story has just about everything as Kirk faces off against his Mirror self and the legendary goatee'd Spock. There's duplicity in abundance and everyone seems to be running to their own agendas in some of the tightest writing that Star Trek comics ever saw. Visually there are a few times the ships look a bit odd but the character resemblances are very close to their real versions. 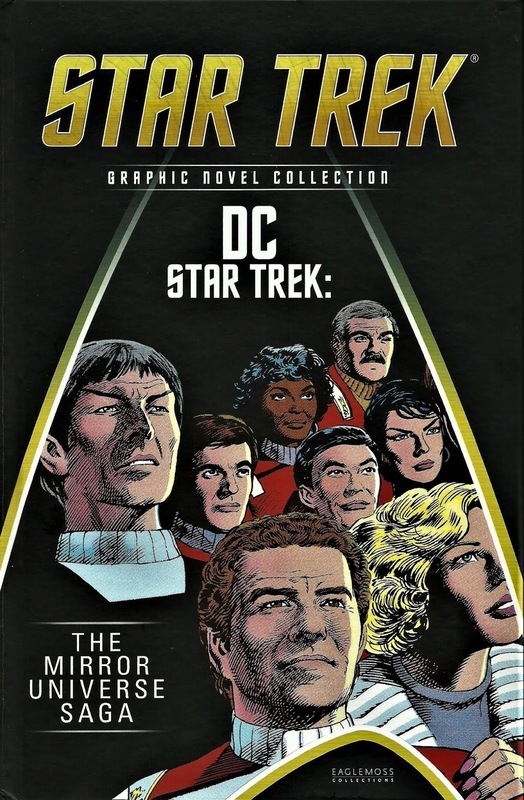 This tale is written by Mike W. Barr who wrote extensively for DC's Star Trek line. Barr had a direct line with Harve Bennett and had a general knowledge of where the movies were heading and so could plan his stories in advance. Once Star Trek III was out of the way, DC decided to do an eight issue tale focusing on the Mirror Universe. 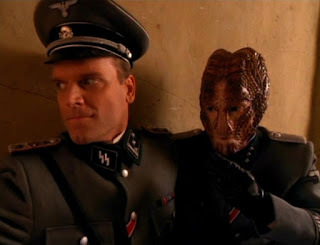 Not only did we get to see the main cast in this alternate story but we also got to see characters such as Saavik with Barr’s own creations Ensign Bearclaw the Klingon Konom. As for the story it’s a classic and I won’t spoil it here but suffice to say 35 years later it’s still considered one of the best for a reason. Issue 38 of the Gold Key reprints is included too; Kirk is relieved of command, turns up on Mobil in disguise while the crew of the Enterprise threaten a mutiny in One of Our Captains is Missing. 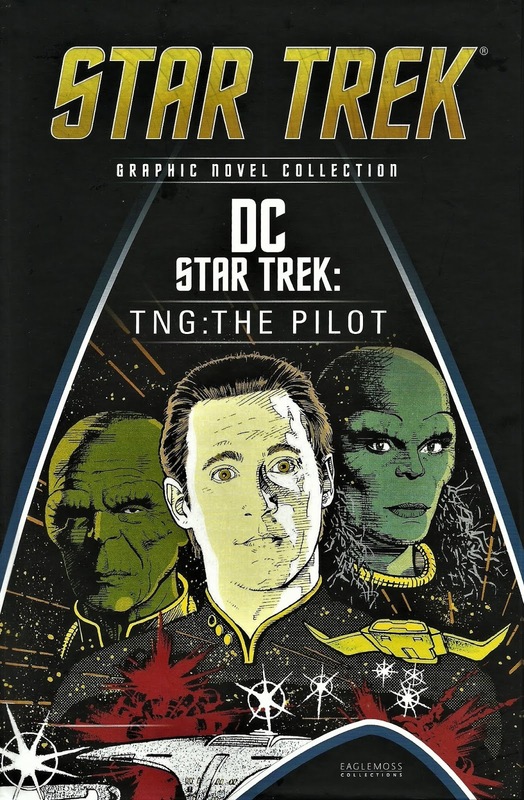 All in all just your usual Gold Key story which ignores pretty much anything to do with canon and there's even a new captain who rubs the crew up the wrong way for added value. Entertaining; certainly. This volume is not to be missed. It’s one of the best. Volume 42 is The Next Generation: The Pilot. Nope, not a graphic novelization of Encounter at Farpoint but an alien takes over Data story. This issue has a story running through all the various tales -the Enterprise is turning up and wreaking havoc in various places but, shock horror it's not. It’s a fairly early attempt at a somewhat serialized story - very popular today in the likes of Discovery. Also something very similar to this thread would be utilised within the fourth season of Enterprise with the Romulan Drone Ship. While it is an interesting idea with the story set during season three it all feels very pedestrian. Even the Gold Key story isn’t all that great. All in all probably one for the completist only. 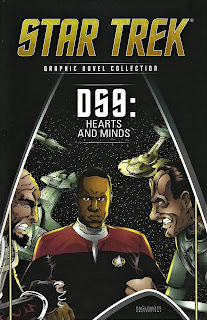 Volume 43 is Deep Space Nine’s Hearts and Minds which was originally published by Malibu Comics and written by Mark A.Altman who you may know from the 50 Year Mission books and the rather excellent Inglorious Treksperts podcast. 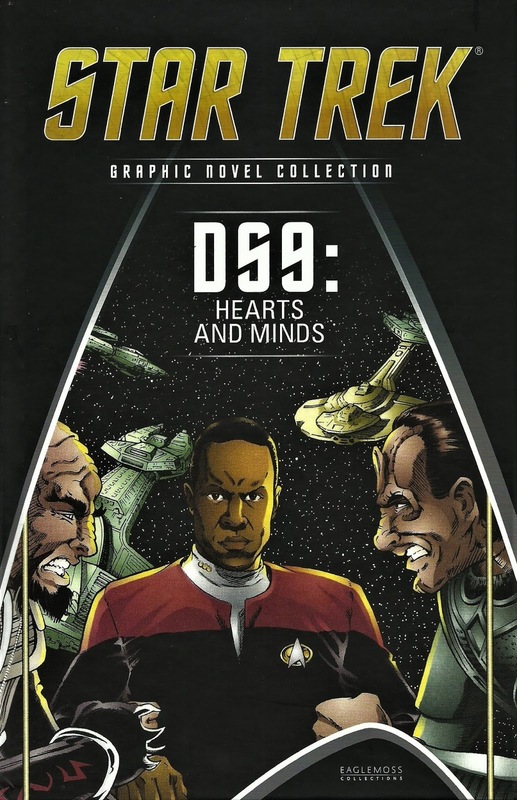 In this tale the Klingons and the Cardassians are out to cause problems for the station. The Klingons arrive looking for a missing ship and their prime suspects are the Cardassians. Naturally this is left up to Captain Sisko to sort out so he dispatches Dax and Bashir along with a Klingon officer to find out what they can about the missing ship. Meanwhile back on Deep Space Nine Quark gets an offer to sell his bar-sell up or be killed! Quark runs straight to Odo and they find out why Maura wants the bar so badly. Character-wise, Altman has these two on the dot and carrying on just as they would in an episode of the show with a situation that's slightly reminiscent of Rivals from season two. Out on a runabout Dax and Bashir are still investigating the missing Klingon ship only to be captured by the Romulans!! It turns out they were behind it all and the Klingons are out for revenge (you'd have thought everyone would have learned what they're like after Unification). Once they’ve dealt with the Romulans we end on a nice bit of interplay between Quark and Odo with the constable keeping the contract that Quark had signed to sell the bar. 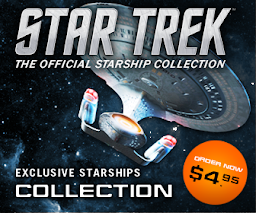 Very in keeping with the nature of the show and also the two classic Deep Space Nine characters. This issues Gold Key is Furlough to Fury which introduces McCoy's daughter Barbara. She appears in another issue of Gold Key but never again. All other references are to Joanna -The Way to Eden was originally to feature her as have any other references throughout any canon or non-canonical material. This is one of the less wacky stories from the Gold Key era and while not canon it’s nice to get a bit of a backstory for McCoy. That's your lot for now from Ian and Clive on The Graphic Novel Collection. Next time we'll be catching up with issues 44 - 47. It's potentially one of Eaglemoss' most ambitious models and one that fans have notched up on their "Must Have" list almost from day one. 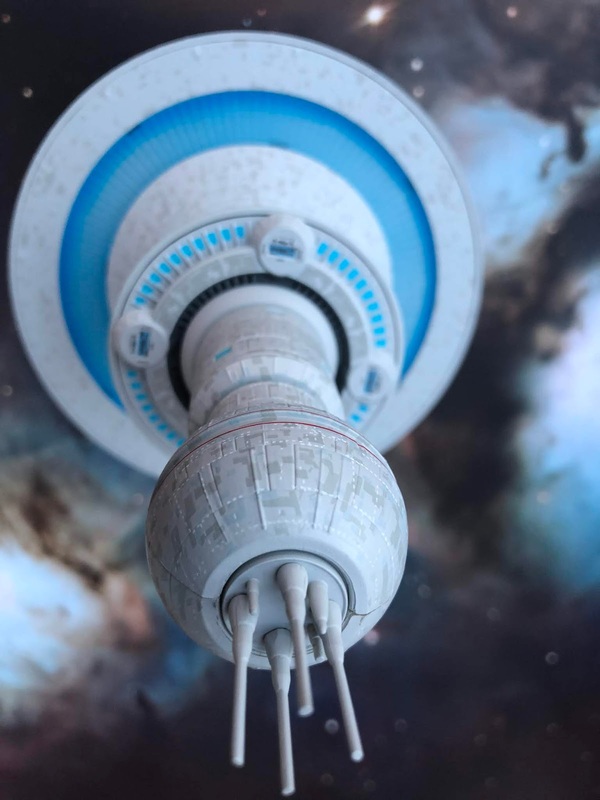 Spacedock; the largest structure recreated as part of The Official Starships Collection has arrived as the fifteenth special edition. 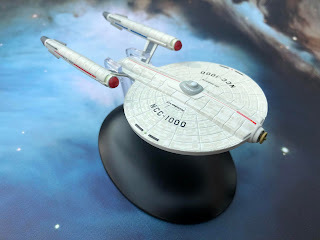 At over 20cm tall, Spacedock is an impressive model and only the third stationary object to be included in the series after Deep Space Nine and K-7. Both of those proved to be highlights of the specials and this is no exception. 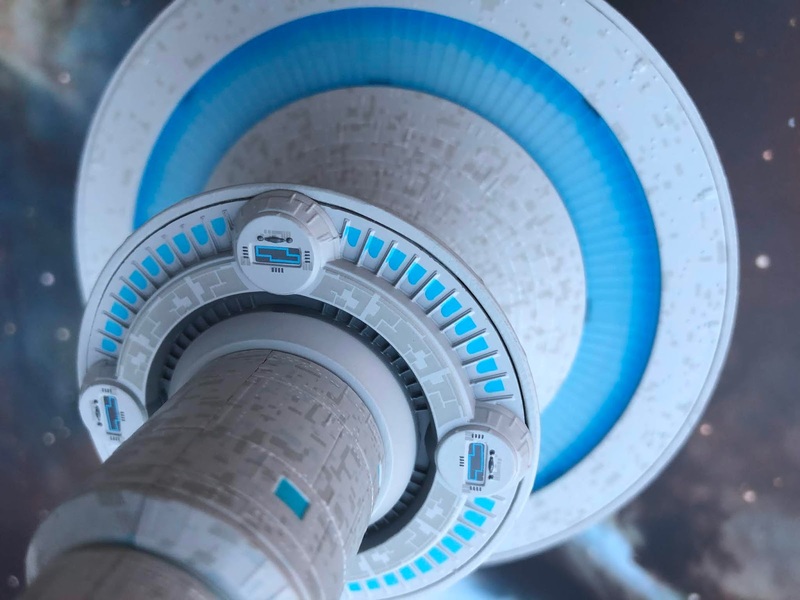 At the top, Spacedock is perhaps at its weakest with a series of aerials and towers protruding from the centre. They look a little thicker than might have been intended but at least there's some structural integrity there to ward away the occasional knock from the cat. The overall finishing coat of light grey is then speckled with taupe panels right across the whole of the surface both looking from the top and from underneath. With this there isn't a surface you can't see since every part is just, well, big and open to analysis. There are literally hundreds of little white spots denoting windows right across the surface neatly aligned with a slight niggle that a couple of the rows do seem to have overlapped with the intermittent red decal striping that arcs around the mushroom-shaped docking area. Each of the four main access doors is numbered (apparently no sense back in 1983) 7, 15, 21 and 28. With these there could have done with being a little more detail given that these four entrances are simply blank panels with number decals and miss the panel detail that is present all around them even just to note where they meet in the middle. Could these perhaps have been done as four door-sized decals to avoid any challenges? On the underside of the docking area we have a large circular translucent blue element which you will recall from the movies is brightly illuminated. 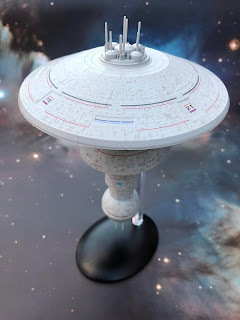 While not lit up here it does stand out very well against the matt grey hull and is held in place with the only metal section of Spacedock which angles inwards towards the bulbous stem. On this piece the speckled taupe versus light grey paint scheme continues as well as the reams of white windows but there are some small, deeper circles which appear to be airlocks to the interior sporadically placed around this element. What you don't appreciate unless you're actually in physical contact with the model is that it's not a flat surface. There are subtle panel undulations all over it which your eyes will only just pick up depending on light and angles. Descending further, we have a series of five different shaped objects from tubes to spheres to make up the majority of Spacedock. On the third piece down - which curves outwards - there are once again the red stripe decals but you can also make out light blue rectangles near to the bottom edge of the section. As with the upper mushroom top and by cross-referencing to the magazine and its onscreen appearances these look like external viewing ports. In fact on the fourth section too there are more indications of docking ports and observation windows. On the underside of this section we have four ports which would appear to be small craft landing pads and while K-7 had the ability to open its shuttlebay up, these are too small a scale to offer this up as an option leaving them just to be a surface detail but there does feel to be a bit of depth to them. In fact the lack of illumination does take some of the awe away but it's not something that can be recreated on something that's scaled down from over three miles in size. In parallel to the large translucent blue ring inserted underneath the mushroom top we have a ring of blue segments which were very well illuminated onscreen and one might suspect are linked to some form of internal power system - possibly positioning thrusters of some form? The bottom three sections are all plastic with a single seam running vertically to join the two halves together. Then to the bottom there's another array of antennas which are not the sturdiest although not as bendable as those on the top. Due to the scale of this one there is a loss of smaller detail and depth to the openings and windows right across the surface but this doesn't mean it isn't a good result. Spacedock is mightily impressive and comes with one of the collection's most ingenious stand designs; a ring into which the station slides and then sits on over the black base. 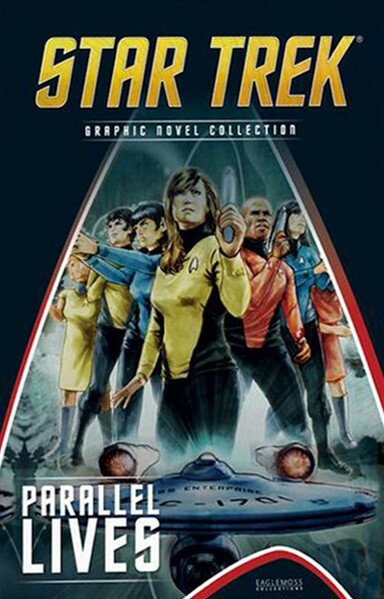 The special mag provides a skimpy overview of the role of the station before diving into a 14 page Designing a Vintage Port which traces the origins of Spacedock back to the space station model from The Motion Picture and the choices around what led to creating something different for The Search for Spock that would be reused for the subsequent three movies and also make a guest appearance in The Next Generation as Starbase 74 in 11001001. The magazine also covers how the interior of the station was created for the classic scene in which Kirk and the crew steal the Enterprise and later how it needed to be recreated for The Voyage Home's unveiling of the Enterprise-A. This is a fantastic model and a very unique item. Some of the more intricate elements such as the antenna are chunky and basic but scale does play against the possibilities here. It looks amazing and feels very sturdy for the main part. If you can find it, get one; you won't be disappointed. Enjoyed the review? Check out the others on our Collection resource or you could like and share!